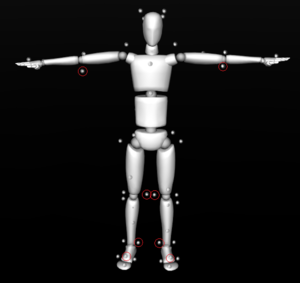 In Motive, skeleton assets are used for tracking human motions. These assets auto-label specific sets of markers attached to human subjects, or actors, and create skeletal models. Unlike rigid body assets, skeleton assets require additional calculations to correctly identify and label 3D reconstructed markers on multiple semi-rigid body segments. In order to accomplish this, Motive uses pre-defined skeleton markerset templates, which is a collection of marker labels and their specific positions on a subject. According to the selected markerset, retroreflective markers must be placed on pre-designated locations of the body. This page details instructions on how to create and use skeleton assets in Motive. When it comes to tracking human movements, a proper marker placement becomes especially important. Motive utilizes pre-programmed skeleton markersets, and each marker is used to indicate anatomical landmarks when modeling the skeleton. Thus, all of the markers must be placed at their appropriate locations. If any of markers are misplaced, the skeleton asset may not be created, and even if it is created, bad marker placements may lead to labeling problems. Thus, taking extra care in placing the markers on intended locations is very important and can save time in post-processing of the data. 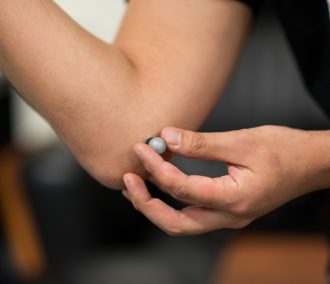 Attaching markers directly onto a person’s skin can be difficult because of hairs, oils, and moistures from sweat. Plus, dynamic human motions tend to move the markers during capture, so use appropriate skin adhesives for securing marker bases onto the skin. Alternatively, mocap suits allow velcro marker bases to be used. Open Skeleton pane and select the markerset you desire to use from the dropdown menu. A total number of required markers for each skeleton is indicated in the parenthesis after each markerset name, and corresponding marker locations are displayed over an avatar that shows up in the Skeleton pane. 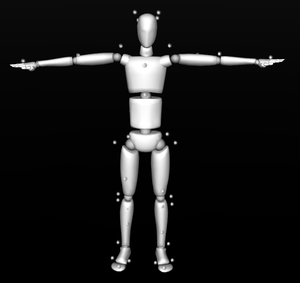 Instruct the subject to strike a calibration pose (T-pose or A-pose) and carefully follow the figure and place retroreflective markers at corresponding locations of the actor or the subject. The marker arrangement displayed over an avatar in the Skeleton pane. All markers need to be placed at respective anatomical locations of a selected skeleton as shown in the Skeleton pane. Skeleton markers can be divided into two categories: markers that are placed along joint axes (joint markers) and markers that are placed on body segments (segment markers). Joint markers need to be placed carefully along corresponding joint axes. Proper placements will minimize marker movements during a range of motions and will give better tracking results. To accomplish this, ask the subject to flex and extend the joint (e.g. knee) a few times and palpate the joint to locate the corresponding axis. Once the axis is located, attach the markers along the axis where skin movement is minimal during a range of motion. Segment markers are markers that are placed on skeleton body segments, but not around a joint. For best tracking results, each segment marker placement must be incongruent to an associated segment on the opposite side of the skeleton (e.g. left thigh and right thigh). Also, segment markers must be placed asymmetrically within each segment for the best tracking results. This helps the skeleton solve to thoroughly distinguish, left-side and right-side of the corresponding skeleton segments throughout the capture. This asymmetrical placement is also emphasized in the avatars shown in the Skeleton pane. Wipe out any moisture or oil on the skin before attaching the marker. Avoid wearing clothing or shoes with reflective materials since they can introduce extraneous reflections. Tie up hair which can occlude the markers around the neck. Place markers in an asymmetrical arrangement by offsetting the related segment markers (markers that are not on joints) in slightly different height. When using the biomechanics markersets, markers must be placed precisely with extra care because these placements directly relate to coordinate system definition of each respective segment; thus, affecting the resulting biomechanical analysis. The markers need to be placed on the skin for direct representation of the subject’s movement. 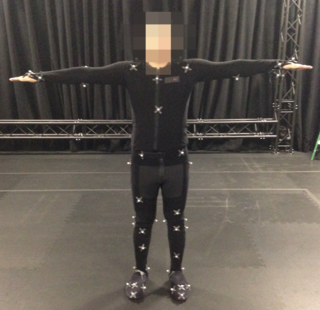 Mocap suits are not suitable for biomechanic applications. While the basic marker placement must follow the avatar in the Skeleton pane, additional details on the accurate placements can be found on the following page: Biomechanics Markersets. All markers need to be placed at the respective anatomical landmarks. Place markers where you can palpate the bone or where there are less soft tissues in between. These spots have fewer skin movements and provide secure marker attachment. Joint markers are vulnerable to skin movements because of the range of motion in the flexion and extension cycle. In order to minimize the influence, a thorough understanding of the biomechanical model used in the post-processing is necessary. In certain circumstances, the joint line may not be the most appropriate location. Instead, placing the markers slightly superior to the joint line could minimize soft tissue artifact, still taking care to maintain parallelism with the anatomical joint line. Use appropriate adhesives to place each markers and make sure they are securely attached. [Motive] Open the Skeleton pane. [Motive > Skeleton pane] Under the Skeleton pane, select the desired skeleton markerset from the drop-down menu. Place the markers on your subject according to the placement shown in the skeleton avatar. For accurate placements, ask the subject to stand in the calibration pose while placing the markers. Double-check the marker counts and their placements. It may be easier to use the Perspective View pane in Motive to do this because the system should be tracking the attached markers at this point. [Motive > Skeleton pane] In the Skeleton pane, make sure the numbers under the Markers Needed and Markers Detected sections are matching. 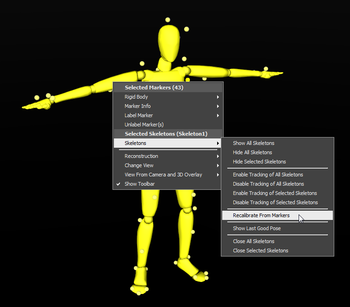 If the skeleton markers are not detected automatically, select the skeleton markers from the 3D perspective view pane. 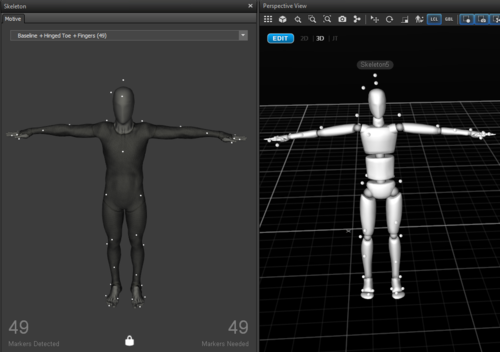 [Motive > Skeleton pane] Next step is to configure the skeleton creation pose settings. Under the Default Settings tab in the Skeleton pane, go to the Skeleton Create Pose Settings and select desired Skeleton Creation Pose. This is set to the T-pose by default. Ask the subject to stand in the selected calibration pose. Here, standing in a proper calibration posture is important because the pose of the created skeleton will be calibrated from it. For more details, read the calibration poses section below. [Motive > Skeleton pane] Click Create in the Skeleton Pane. If you are creating a skeleton in the post-processing of captured data, you will have to auto-label the Take to see the skeleton modeled and tracked in Motive. 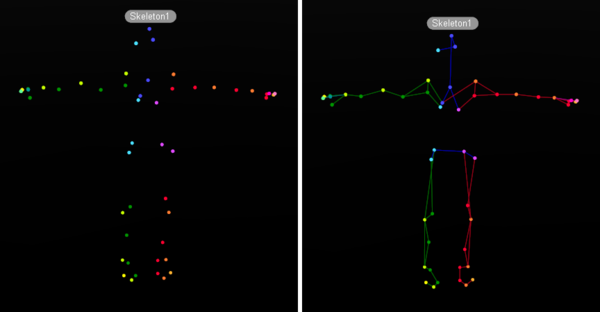 After creating the skeleton model, confirm all skeleton segments and assigned markers are located at expected locations. If not, delete and create the skeleton again after adjusting the marker placements and the calibration pose. Creating a skeleton asset in Motive. Creating a skeleton from Assets pane. Properties for the selected skeleton is described in the Properties pane. By configuring Skeleton Properties, you can modify the display settings as well as skeleton creation pose settings for skeleton assets. For newly created skeletons, default skeleton creation properties are configured under the Skeleton Pane or the Application Settings pane. Properties of existing, or recorded, skeleton assets are configured under the Properties pane. A proper calibration posture is necessary because the pose of the created skeleton will be calibrated from it. Read through the following explanations on proper T-poses and A-poses. 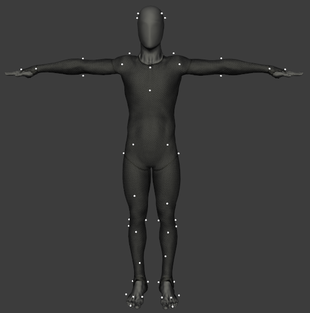 The T-pose is commonly used as the reference pose in 3D animation to bind two characters or assets together. Motive uses this pose when creating skeletons. A proper T-pose requires straight posture with back straight and head looking directly forward. Both arms are stretched to each side, forming a “T” shape. Both arms and legs must be straight, and both feet need to be aligned parallel to each other. The following diagrams, taken from the Skeleton Pane, show examples of a proper T-pose. 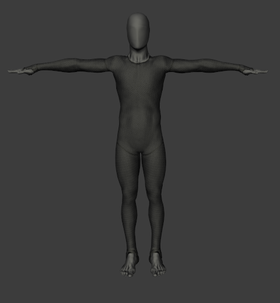 Front view of the T-pose. 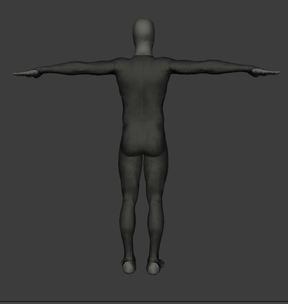 Back view of the T-pose. Palms Down: Arms straight. Abducted, sideways, arms approximately 40 degrees, palms facing downwards. Palms forward: Arms straight. Abducted, sideways, arms approximately 40 degrees, palms facing forward. Be careful not to over rotate the arm. Elbows Bent: Similar to all other A-poses. arms approximately 40 degrees, bend elbows so that forearms point towards the front. Palms facing downwards, both forearms aligned. Many skeleton markersets do not have medial markers because they can easily collide with other body parts or interfere with the range of motion, all of which increase the chance of marker occlusions. However, medial markers are beneficial for precisely locating joint axes by associating two markers on the medial and lateral side of a joint. For this reason, some biomechanics markersets use medial markers as calibration markers. Calibration markers are used only when creating skeletons but removed afterward for the actual capture. These calibration markers are highlighted in red from the 3D view when a skeleton is first created. After creating a skeleton from the Skeleton pane, calibration markers need to be removed. First, detach the calibration markers from the subject. Then, in Motive, right-click on the skeleton in the perspective view to access the context menu and click Skeleton → Remove Calibration Markers. Check the assigned marker positions to make sure that the skeleton no longer expects markers in the corresponding medial positions. A skeleton asset with calibration markers. Existing skeleton assets can be recalibrated using the existing skeleton information. Basically, the recalibration recreates the selected skeleton using the same skeleton markerset. 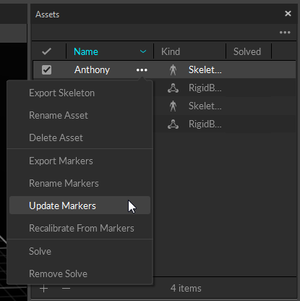 This feature recalibrates the skeleton asset and refreshes expected marker locations on the assets. To recalibrate skeletons, select all of the associated skeleton markers from the perspective view and click Recalibrate From Markers which can be found in the skeleton context menu from either the Assets pane or the Perspective View pane. When using this feature, select a skeleton and the markers that are related to the corresponding asset. Skeleton recalibration do not work with skeleton templates with added markers. 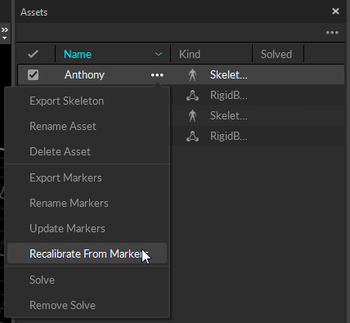 Recalibrate from selected marker in the Assets pane. Recalibrate from selected marker in the Perspective View pane. Skeleton marker colors and marker sticks can be viewed in the perspective view pane. They provide color schemes for clearer identification of skeleton segments and individual marker labels from the perspective viewport. To make them visible, enable the Marker Sticks and Marker Colors under the Application Settings or under the visual aids in the perspective view pane. Default color scheme is assigned when creating a skeleton markerset. To modify them, export and edit the skeleton template XML file, where the custom marker labels can also be assigned. The marker colors and sticks are featured only in Motive 1.10 and above, and skeletons created using Motive versions before 1.10 will not include the colors and sticks. For the Takes recorded before 1.10, the skeleton assets will need to be updated from the Assets pane by right-clicking onto an asset and selecting Update Markers. The Update Markers feature will apply the default XML template to skeleton skeleton assets. (Left) Marker colors enabled in the perspective view. (Right) Both marker sticks and marker colors enabled in the perspective view. Updating skeleton markers to visualize marker sticks and color for skeletons created Motive versions below 1.10. Skeleton markersets can be modified slightly by adding or removing markers to or from the template. Follow the below steps for adding/removing markers. Note that modifying, especially removing, skeleton markers is not recommended since changes to default templates may negatively affect the skeleton tracking when done incorrectly. Removing too many markers may result in poor skeleton reconstructions while adding too many markers may lead to labeling swaps. If any modification is necessary, try to keep the changes minimal. When adding, or removing, markers in the Edit mode, the Take needs to be auto-labeled again to re-label the skeleton markers. First, enable the Assign Markers To Skeleton feature from the perspective view pane. When selecting a skeleton segment with this feature enabled, associated markers will be highlighted. Select a skeleton segment that you wish to add extra markers onto. Then, associate the marker(s) and the segment by Ctrl + left-clicking on the markers. If done properly, a blue line will connect the selected marker and the segment. Reconstruct and Auto-label the Take. When you manually add extra markers to skeletons, the markers will be labeled SegmentName_# in relation to the associated segments, and they will be included at the end of the skeleton XML file. If you wish to modify the name of the added label, you have to export the marker name XML file (Export Markers) from the Assets pane, modify the name attribute, and import the modified XML file (Rename Markers). See: Marker Name XML Files page for additional instructions. First, enable the Assign Markers To Skeleton and the Assigned Marker Selection from the perspective view pane. Select the skeleton segment that you wish to modify and select the associated Assigned Marker or solved marker. Delete the association by pressing the Delete key while the marker and the segment is selected. A pop-up dialogue asking whether to un-assign currently selected marker from the skeleton. Select Yes. There are two ways of obtaining skeleton joint angles. Rough representations of joint angles can be obtained directly from Motive, but the most accurate representations of joint angles can be obtained by pipelining the tracking data into a third-party biomechanics analysis and visualization software (e.g. Visual3D or The MotionMonitor). 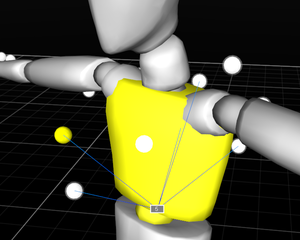 A rough representation of joint angles can be obtained by either exporting or streaming the skeleton rigid body tracking data. When exporting the tracking data into CSV, set the Coordinate Space setting to Local to obtain bone segment position and orientation values in respect to its parental segment, roughly representing the joint angles by comparing two hierarchial coordinate systems. This can also be done in data streaming by setting the Local Rigid Bodies to true in the data streaming pane. Each skeleton asset has its marker templates stored in an XML file. By exporting, customizing, and importing the skeleton XML files, a skeleton markerset can be modified. 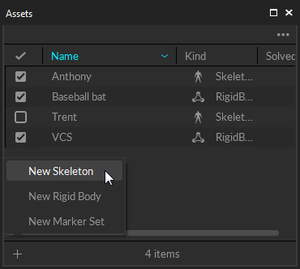 Specifically, customizing the XML files will allow you to modify skeleton marker labels, marker colors, and marker sticks within a skeleton asset. For detailed instructions on modifying skeleton XML files, read through Skeleton Tracking: Marker Name XML Files page. To export a skeleton XML file, right-click on a skeleton asset under the Assets pane and use the Export Markers feature to export corresponding skeleton marker XML file. 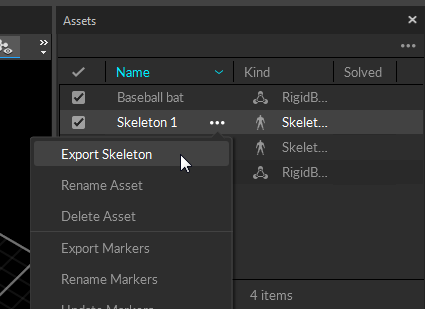 To import a skeleton XML file on an existing skeleton, right-click on a skeleton asset under the Assets pane and use Rename Markers feature. To import the XML file for a new skeleton from an existing template, specify the file directory under Marker Names section in the skeleton pane when creating a skeleton from reconstructed markers. This page was last modified on 31 May 2018, at 14:52.